"One of the most prestigious heritage hotels of India has to be the legendary Fort Jadhavgarh. The hotel is reminiscent of the glory of Old Maratha warriors and the antique charms inside the hotel truly mesmerize one and all. With modern surprises available at every step in the hotel, it offers one of the most intriguing and fascinating stays in the city of Pune. Fort Jadhavgadh was built by Pilaji Jadhavrao when he was included in the army of Chhatrapati Shahuji in his war against Mughals. He played a major role in the war when he took his men across Jadhavgadhi where he trained them men the art and craft of sword fighting. He built a fort here to prevent attacks from enemy battalions. Because of his valiant efforts, Chhatrapati Shahuji was able to restore Maratha Empire in its utmost glory. Fort Jadhavgarh has a total of 57 rooms. The accommodations comprise of 3 suites, 38 rooms of various types, 12 royal tents and 4 Neem cottages spread across the fort's three wings. The interiors are a mix of old world charm and contemporary luxuries. The Maharaja suite is truly a royal indulgence. The luxuries are fit for royalty. Enjoy a panoramic view of the surrounding hills as you spend time in your magnificent accommodation. 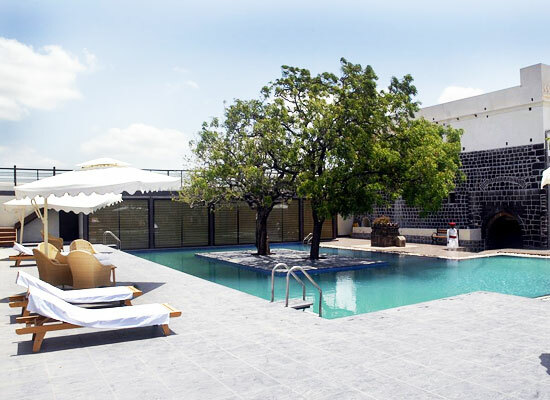 The Maharani Suite is located at the top of the fort, with a direct access to the swimming pool and the spa. The Museum Suite is located on top of the museum with its very own private entrance. The lavish accommodation has a host of amenities and is one of the most sought after rooms of the fort. Situated on the top level of the main fort, the Hill View Daalan- Premium Room is a lavish accommodation for guests. The room opens up to a balcony overlooking the lawns and providing a view of the vast open spaces. 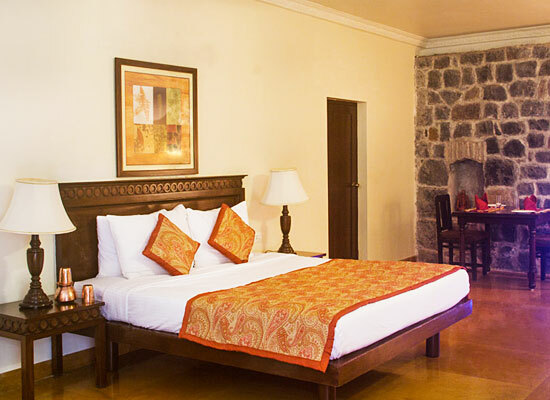 Located on the lower level of the main fort, the Varsha Suite is a spacious room. They have a uniquely designed bathroom with a rain shower. You can gaze up at the stars and feel the cool hill breeze together that too while having a relaxing shower. 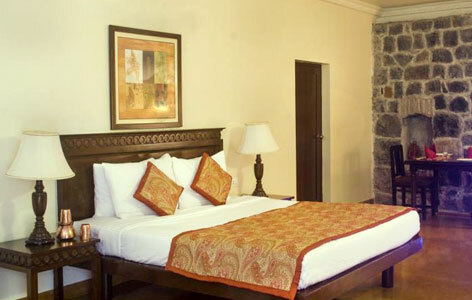 The Kholi- Deluxe rooms of the Fort are equipped with all conveniences and luxuries of the modern world. Revel in the beautiful setting with views of the lush surroundings. The Chaavni Royal Tent is uniquely something different to try during your stay in Fort Jadhavgarh. 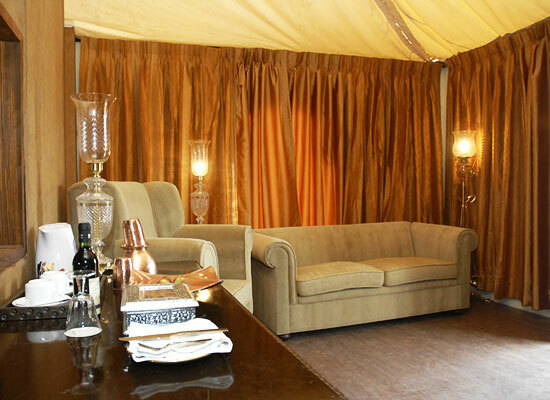 The luxurious tent is equipped with all modern amenities and an attached bath area. The Neem Forest Cottages are 4 ecofriendly cottages. Set in the quaint surroundings filled with nests and chirping birds, these are uniquely built to spend time in nature. Completely air conditioned and with all the modern amenities, guests are treated to a comfortable stay. Chhajja: The multi-cuisine restaurant serves guests with delicious palettes of Indaina dn International cuisines. Payatha: This Marathi restaurant specializes in Maharashtra cuisine. 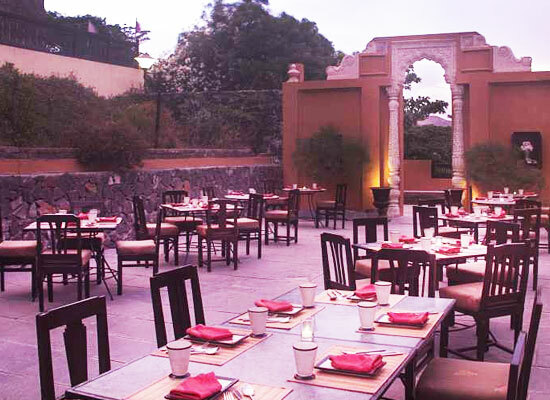 Aangan: The tourists come here for the taste of some of the best wines in the world amidst gorgeous locations. It is ideal for holding dinner business gatherings. Kund:The4is pool side bar offers delicious quick bites with some of the most refreshing beverages. The city of Pune in Maharashtra is one of the largest metropolitan cities in the country. The city has gained popularity because of its excellence in Training institutes, Government & Private sector Research Institutes, Automobile, Management, Information technology (IT) and Educational, Manufacturing, etc. It is the central district that features traditional Marathi culture. Art, culture and education are given utmost importance in Pune. Pune University is one of the oldest universities in the world and is often called as the “Oxford of the East”.